Hieronymus Bosch (c 1450–1516), The Temptation of Saint Anthony (fragment) (c 1500-10), cat. 3, oil on oak panel, 38.6 x 25.1 cm, Nelson-Atkins Museum of Art, Kansas City, MO. Wikimedia Commons. Matthijs Ilsink, Jos Koldeweij et al. Hieronymus Bosch (c 1450–1516), The Temptation of Saint Anthony (c 1500-1510), cat. 4, oil on oak panel, 144.8 x 238 cm, Museu Nacional de Arte Antiga, Lisbon. Wikimedia Commons. To coincide with the five-hundredth anniversary of Bosch’s death in August, the members of the Bosch Research and Conservation Project (BRCP) have produced this massive account of his paintings and drawings. 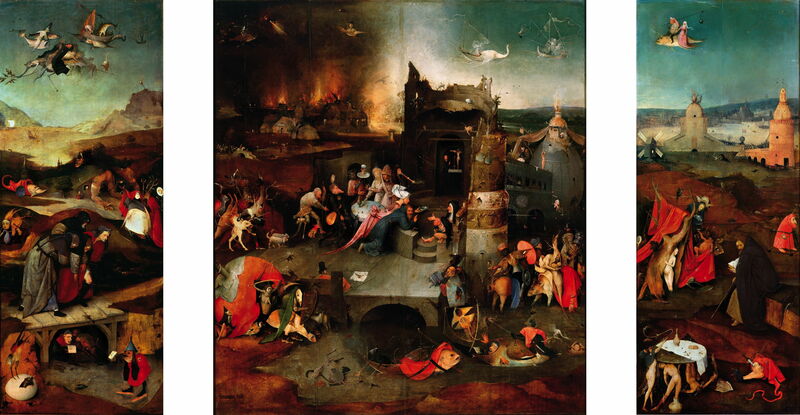 A second volume covers the more technical studies: edited by Luuk Hoogstede & Ron Spronk, Hieronymus Bosch, Painter and Draughtsman: Technical Studies, is also published by Yale UP and Mercatorfonds (ISBN 978 0 300 22015 5) and costs around £76.50. This volume consists of three main parts. The first provides over 100 pages of introductory essays, with a meticulously-researched biography, an examination of what is a Bosch which explains what the BRCP considers is evidence of his authorship, an excellent chapter on materials and techniques, and a review of conservation aspects. The chapter on materials and techniques has really been stolen from the second volume, as it is a synthesis and overview of the painting-by-painting account given there. Its inclusion in this volume makes this by far the more important for most readers. The second part is the catalogue raisonné of paintings, and the third that for drawings. Together they make up the bulk of the book, and it is extremely bulky. Each entry starts by giving the usual information expected in a catalogue raisonné: attribution, dates, physical details including dimensions, location of the work, any signature or other identifying mark, a brief statement of condition, the provenance, literature, and a short analysis of the work. Hieronymus Bosch (c 1450–1516), The Tree-Man (date not known), cat. 35, pen and brown ink on paper, 27.7 x 21.1 cm, Albertina, Vienna. Wikimedia Commons. Once these formalities are completed, the authors work systematically through a description and analysis of the work. As several are polyptychs which open and close, they start with its closed state, providing vivid accounts of its exterior, opening, and the sensations accompanying its opening. Each state is illustrated in overview, then there are numerous detailed views of the work, including some IR and other non-visible-light studies. Rather than litter the pages with multiple and repetitive captions, each is cited in the white space next to the relevant section of text, which works very well. At the end of each account is a section explaining the proposed dating, including details of any commission, followed by the end-notes. End matter is as thorough as the rest of the book. There is a compilation of three literary sources, given in the original language, and translated into English, from Felipe de Guevara (c 1560), José de Sigüenza (c 1605), and Karel van Mander (1604). The bibliography is long and extensive, and there are two indexes: the first of names, and the second a topographical index of the works. As several other reviewers have remarked, this certainly sets the standard for catalogues raisonnés, at least for artists with relatively limited oeuvres. Workshop of Hieronymus Bosch or follower, The Seven Deadly Sins and The Four Last Things (c 1510-20), cat. 34, oil on poplar panel, 120 x 150 cm, Museo Nacional del Prado, Madrid. Wikimedia Commons. The most controversial aspect of any attempt at a catalogue raisonné – and as the output of the BRCP this has to be the benchmark for many years to come – is the decision as to which works to include. They have chosen 21 paintings (of which one, the Wayfarer Triptych, is split across four locations) as being Bosch’s own, four are attributed to his workshop, seven to followers, and two to his workshop or followers. 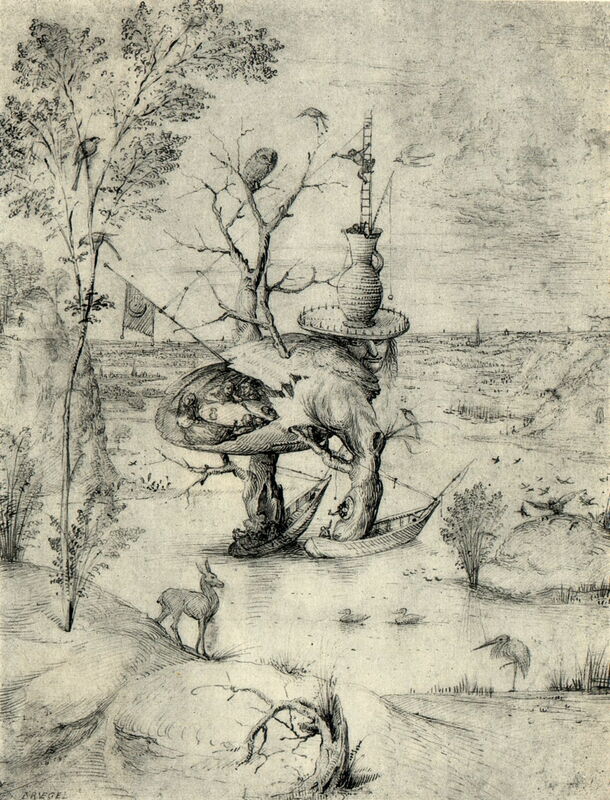 There are also 20 drawings attributed here to Bosch himself. Comparing different choices of attributions is always complicated by different conventions in the naming of works. 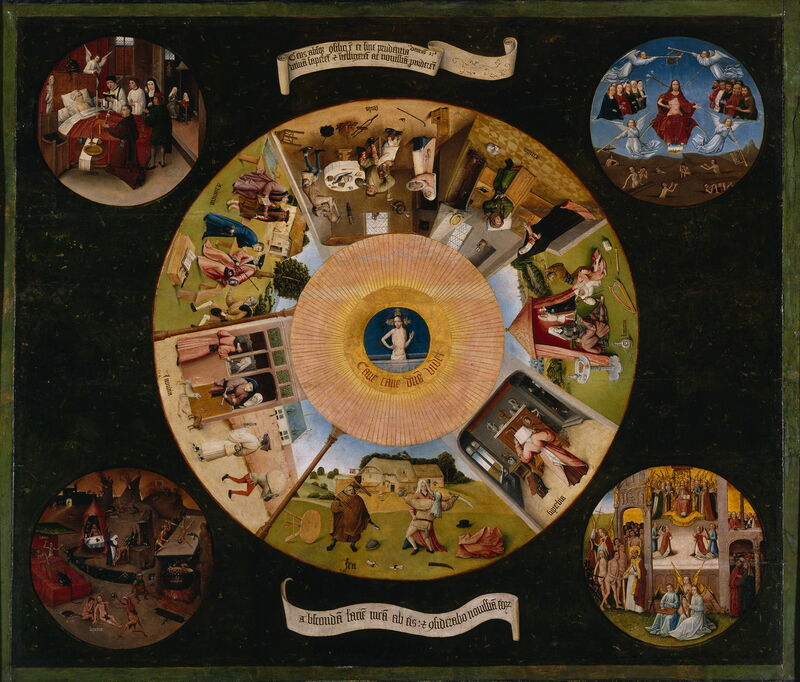 However, there will be those who are unhappy that the BRCP considers The Seven Deadly Sins and the Four Last Things (in Madrid) to be the output of Bosch’s workshop or a follower. 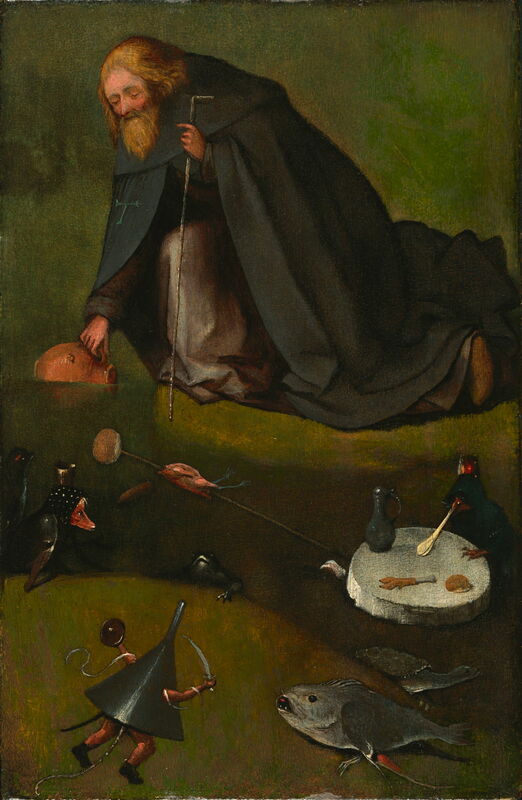 The recently proposed fragment of The Temptation of Saint Anthony in Kansas City is accepted as being by Bosch himself. No doubt those and other debates will continue. This is a superb and definitive book, which serves almost every purpose, except of course portability. It is utterly authoritative, comprehensive, illustrated better than any other, thoroughly accessible and readable. It is also the most expensive book on Bosch in print, but worth every penny. Posted in General, Painting and tagged book, Bosch, catalogue raisonné, review. Bookmark the permalink. Great post. I am a huge fan of Bosch. I was blown away when I first saw his works at the Prado museum in Madrid a few years ago. When I look at his works like the Garden of Earthly Delights I am amazed to think that they were painted over 500 years ago – I mean who else was doing paintings like this around that time? Thank you. I hope that you will enjoy my future articles celebrating his life and work, in the coming months.